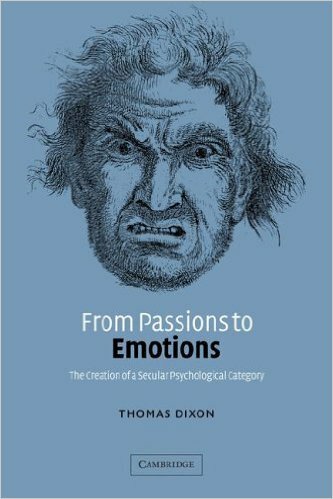 Thomas Dixon is Director of the Centre for the History of the Emotions at Queen Mary University of London. His books include From Passions to Emotions (2003) and Weeping Britannia: Portrait of a Nation in Tears (2015). Following on from a post by Markus Wagner and Sofia Vasilopoulou about the role of emotions in determining the result of the EU referendum, here Thomas tries to keep up with some of the emotional responses the result has produced from voters, politicians, and journalists. For a historian of emotions interested in how social, linguistic, and emotional changes happen in tandem, the last few months have been fascinating. The scene had been set for me back in November 2015 when Oxford Dictionaries announced that their Word of the Year was not a word at all, but a crying-face emoji. This pictograph had been chosen ahead of the rest of a shortlist which included the term ‘Brexit’. Our technology, our language, our politics, and our feelings were already evolving together. In the last few weeks this process has accelerated to a frantic pace. I started writing this post on political emotions many times, but found myself repeatedly outpaced by the speed of the Brexit melodrama. Right, I'm having #Brcoffee and #Brtoast then I'm going to #Brvote #Bremain. And then tomorrow our spelling will return to normal. I wasn’t feeling so cheery the next day, having watched with horror as the results came in, and seen Nigel Farage proclaiming victory for Leave. An opinion poll trying to get ‘Inside the mind of the voter’ found that many Remain voters had been reduced to tears by the result and were feeling emotions of sadness, frustration, and anger. It was all getting very Bremotional. On social media, several people compared their feelings of loss with the famous five stages set out by Elisabeth Kübler-Ross in her 1969 book On Death and Dying, based on interviews with dying patients. I am angry that my children’s future has been put at risk by a needless referendum. Angry at the brazen mendacity of a Leave campaign which has no idea what happens next. Angry at the careless elitism of Michael Gove, Boris Johnson, Steve Hilton and other leading Brexiters, parading themselves as tribunes of the people from their gilded worlds in Westminster, North London and California. It was still only Friday 24th June and I already had far too many opening paragraphs for this blog post. A whole post about the nature of anger now seemed like the best idea, and I started to think about this while also writing a couple of short talks about my new work on anger for the ‘Living With Feeling’ project. I was also intrigued to learn from the research of Markus Wagner and Sofia Vasilopoulou that voters who were angry about the EU were more likely to vote Leave than those who were fearful. What are politicians doing, I asked myself, when they invoke this anger? Why were some commentators impressed by the apparently genuine anger shown by David Cameron when he exasperatedly demanded that Jeremy Corbyn should resign, during Prime Minister’s questions? Is there a significant difference between the anger of a Liberal Democrat and the anger that drives a UKIP voter (discussed here by Nick Robinson in 2014)? Is political anger something physiological, or moral, or both? What is the relationship between grief and anger? Can one be converted to the other, as suggested in the quotation from Macbeth in the title of this post? Or was Malcom X right that it was only anger, and not tears, that could bring political change? 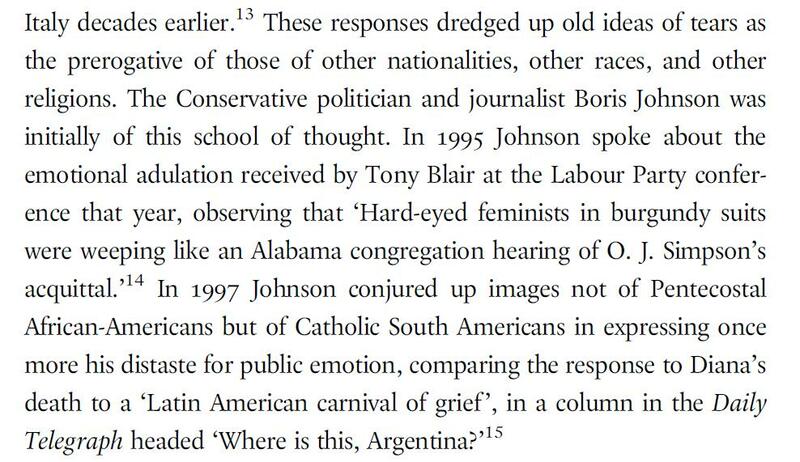 From Thomas Dixon, Weeping Britannia (2015), p. 304. But three days later Johnson had been stabbed in the back by his erstwhile sidekick Michael Gove and was no doubt having some pretty strong feelings of dismay, and loss, and confusion of his own. He was no longer the emotional focus of Brexit. The melodrama had moved on, leaving Johnson fuming about the atmosphere of ‘hysteria’ in the country. The ‘contagious mourning’ was giving him unwelcome flashbacks to that emotional Diana moment nearly two decades ago. Not for the first time, it was as though he had gone to sleep in Islington and woken up in Buenos Aires or, perhaps even worse, at the dawn of Blair’s Britain. But soon the emotional and angry Andrea Leadsom – reportedly reduced to tears by the hostile response that interview provoked – had gone the same way as all the other potential rivals to the notably restrained Theresa May. So Leadsom’s feelings are no longer the story either and the focus has switched not only to the new Prime Minister Theresa May but also to the woman who would like to lead the opposition to her government, Angela Eagle. John Humphrys has form on this subject, and was another one of those I wrote about in Weeping Britannia. 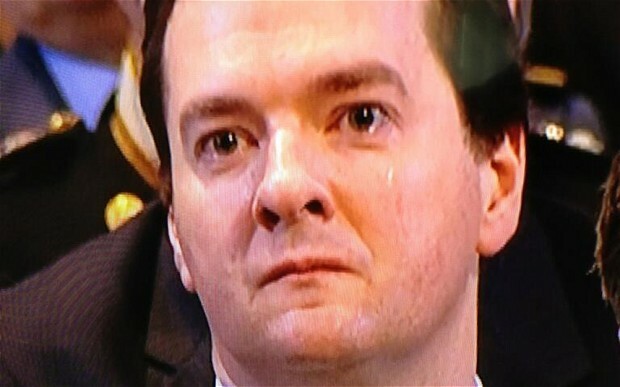 When George Osborne shed a tear at Margaret Thatcher’s funeral, he too was grilled by Humphrys on The Today Programme, about whether he was generally the ‘sort of person’ who wept, rather than being too ‘macho’ to show his feelings. So, despite my attempts to move on from tears to anger, from the Diana effect to Brexit rage, politicians and commentators keep dragging me back, kicking and weeping, to my previous research project. So, I thought it would be appropriate to end this chaotically emotional post with a paragraph that I cut from the final text of Weeping Britannia, but which is now particularly apt, given Theresa May’s installation as Prime Minister, and John Humphrys’s assertion that he couldn’t imagine her crying. The only woman currently considered a likely candidate to succeed David Cameron, and who would face comparisons if she did so with the Conservatives’ first and only female leader to date, is Theresa May. 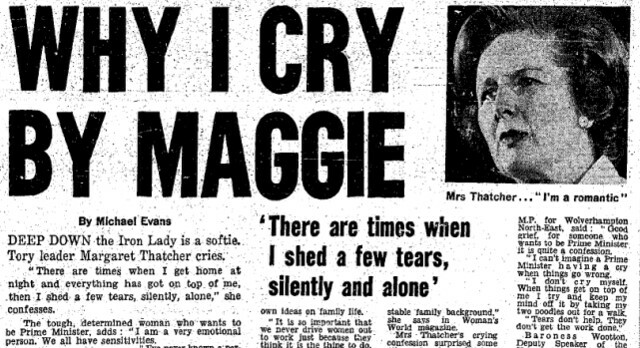 In an interview in 2012, Theresa May, like Margaret Thatcher before her, was asked to reveal her ‘softer side’. In response she spoke about her love of shoes, cookery, and walking. ‘Ask what makes her cry, though’, the interviewer complained, ‘and the defences go up again. “I’m not somebody who often tears up in public,” she says.’ Politicians each have their own emotional style, and Tony Blair proved that emoting need not be accompanied by tears, but Theresa May will need to do better than this if she wishes to satisfy the post-Thatcher appetite for public displays of private emotion. David Cameron should monitor his Home Secretary’s future interview performances carefully. If one appears under the headline, ‘Why I Cry by Theresa’, he will know that her ambitions have reached a new level. But in the newly hyper-emotional world of post-Brexit Britain, perhaps I was wrong. Perhaps it is Theresa May’s very unemotional demeanour that has marked her out as the best possible leader in a time of crisis – someone who, unlike more or less all her rivals and opponents, has not succumbed to the Bremotional turmoil of the last two weeks. This entry was posted in Emotional Currents, Living With Feeling, Politics of Emotion and tagged Angela Eagle, anger, Boris Johnson, Branger, Bremotional, Brexit, feelings, John Humphrys, Kubler Ross, Labour Party, political emotions, politics, rage, tears, Theresa May, UKIP by Thomas Dixon. Bookmark the permalink.